After 30 days of intensive electioneering, the public's verdict is being delivered and it's almost all over. As the results emerge during the early hours of 6 May, the BBC will be on hand to offer comprehensive coverage online, on television and on radio. Through the night the BBC News election website will offer up-to-the-minute results, breaking news and analysis. You can get your own constituency result delivered direct to your desktop by signing up to the Peter Snow news alert service. Our desktop score card, which sits on your computer screen and automatically updates, will keep you up to speed with the latest results and national overview, and alert you to a specific constituency result after a postcode has been entered. On the website our clickable, constantly updated map lets you glide over the UK or zoom-in on individual seats. Scoreboards will keep you up-to-date with the national and regional picture while every constituency has its own page where you can see full details of how the candidates have done - access yours just by typing in a postcode. Alongside there will be latest news reports from across the country, detailed analysis, best pictures of the night's action and titbits from BBC correspondents in our weblog, the Election Monitor. Anyone gathering with friends or family to see the results come in can use our party pack to help things go with a swing (not the Peter Snow variety). And you can keep an eye on all the live television and radio coverage through the BBC News Election Player - just hit the button available top right on every page of the election website. The Player will feature election night highlights on demand as well as continuing live coverage of key speeches the day after. Meanwhile the Election Night programme on BBC One, with David Dimbleby, Jeremy Paxman and Peter Snow, kicks off at 2155 BST. Scottish television viewers will be taken through the night by Anne MacKenzie, Brian Taylor and Jackie Bird while in Wales Huw Edwards, David Williams and Betsan Powys will be overseeing events. A new range of options will be available for viewers with digital TV. At a press of the red button, a number of separate video streams will enhance the main programme, including a constantly updated headlines bulletin. Viewers with digital satellite will be able to watch key moments of the night. 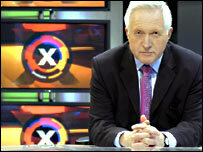 Those wanting a lighter look at the election are catered for with special programmes on BBC Two and BBC Three. Radio 4's coverage is fronted by James Naughtie and Carolyn Quinn, while, for the first time, Radio Five Live is joining forces with the BBC Asian Network and 1Xtra, with presenters including Peter Allen, Jane Garvey, Sonia Deol and John Pienaar. Jeremy Vine takes the helm on BBC Radio 2 with his election special starting at 2230, and the BBC World Service special takes to the airwaves from 2105. Polls close up and down the country. Just one minute later the BBC will broadcast the results of an exit poll based on a sample of 13,000 voters from 320 polling stations in marginal constituencies. The first result of the night is expected. The race to be first is traditionally intense, with Houghton and Washington East, Sunderland North and Sunderland South likely to be among the contenders. Sunderland South won the race in 1992, 1997 and 2001. The fastest ever count took place at a by-election in 1928 in Ashton-under-Lyne, where the mayor arranged for coloured rockets to be fired from the town hall roof to declare the result. The first trickle of results should turn into a torrent in the next hour, with more than 30 declarations expected at 0030 alone. First result from Scotland, in Na h-Eileanan an Iar (formerly the Western Isles), expected at 0001, and first in Wales, in Islwyn, expected at 0030. By now nearly 150 results should be in, and the likely shape of the next parliament should be clear. Following a frenetic 60 minutes or so, results should now be in from more than half of the 645 seats being contested. A surge of late results expected. Carmarthen West and Pembrokeshire South due to be last result declared in Wales. By now all but a handful of results from the mainland should be in. Last result in England, the sprawling rural Yorkshire seat of Skipton and Ripon, due. Last of the mainland constituencies, Argyll and Bute in Scotland, due to declare. The first of the 18 Northern Ireland constituencies expected to declare. Result due from the last Northern Ireland seat and last of all 645 UK seats.